Size of Male: 75-105 lbs., >28 in. Size of Female: 60-85 lbs., >26 in. 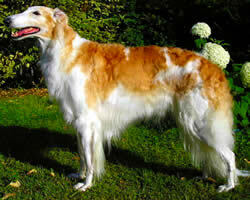 Save for their obviously canine appearance and formidable size, the Borzois dog will remind you much of cats. The breed is mild-mannered, and yet there are days when the sight hound’s thrill for a chase becomes relentless and unstoppable. The dog is one of the popular dog breeds in the area of commercial glam modeling. This elegant and able dog breed dates back to the early 13th century. “Borzoi,” in Russian tongue, literally means “fast” and “insolent.” Until 1938, however, the dogs were known as the Russian Wolfhound. Apart from exclusively gracing the Russian palaces, this dog breed underwent crosses to fine-tune the dog’s hunting skills. In the 17th century, a hunting guide which centers on this breed was published. The immense popularity of the breed was apparent as hunters allowed for up to 100 of these Russian Wolfhounds to join a singular hunt. This was also the period when up to 7 subtypes of the breed were identified in Russia. The breed population may have dwindled after the Russian Revolution, but today you’ll get to see the same dignified breed stealing the spotlight in dog shows and movies. Strange as it may seem, a lot of kids find this competent wolf hunter to be not playful enough. In fact, caution must be exercised when handling this quiet and brave breed. Borzois dogs do not like to be teased and will instinctively bite when startled. They tend to show off their playful and hunting nature outdoors. The dogs aren’t that friendly to other canines and small animals. Living Environment – The coldest temperatures will not destroy these dogs, but heat has the opposite effect. When considering to raise this Russian Wolfhound, make sure your residence is sited on the chilly part of the planet. Since they thrive on constant human attention and companionship, the pooches are happiest indoors. They also require access to a large and securely fenced yard. Grooming – These longer-haired dogs are heavy shedders. On the average, brushing every other day is recommended. Prepare to step up the frequency to daily combing as the need arises. Dry shampooing may sometimes be necessary. Don’t forget to trim the fur between the toes. Diet & Exercise – Since gastric torsion is commonly seen in this breed, do not lump the feedings in one day. Instead, schedule small but frequent meals. Avoid serving fish, beet and rice which may trigger bloat attacks. This dog’s traditional diet consists of wheat and venison. Daily exercise is a must for these hunting dogs, and the pooch could use a large yard in this respect. As long as the area is secure, you may allow them to gallop or sprint freely. A long, leashed walk will also suffice. Health – These dogs are sensitive to anesthesia and may be prone to bloat, but other than these two minor issues, there are few major health risks to worry about. There might be chances of progressive retinal atrophy in some dogs, as well as heart disease and cancer. In the dog training arena, respect training is imperative. The Borzoi’s feline and independent attitude, emotional sensitivity and gigantic physique altogether require a lot of patience. This dog breed has an aversion to harsh physical techniques, too, but they are rather quite cooperative when it comes to housebreaking. Their desire to stay clean accounts for this willingness.